Clean your car from top to bottom with our range of incredible car detailing bundles. 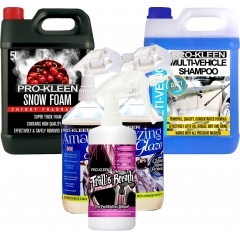 These kits offer huge savings on a variety of car washing products including our best-selling Snow Foam, car shampoos, Amazing Glaze Wash & Wax, iron contamination remover, tyre cleaners, and more. 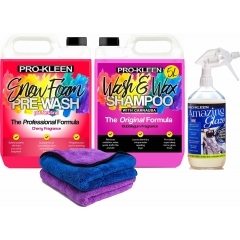 At Pro-Kleen, we’re proud to offer professional-quality detailing products at affordable prices. 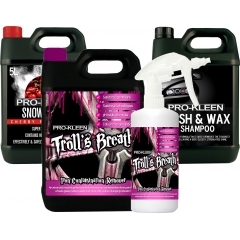 We don’t compromise on quality, which might explain why Pro-Kleen is now one of the UK’s favourite car care brands! 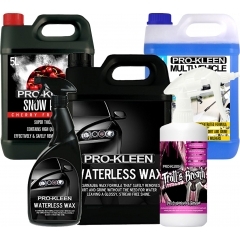 The bundles above offer you a range of options to help you boost the appearance of your car’s paintwork and wheels. Remove dirt, brighten and protect your car’s paintwork, break down iron contamination on your alloys, and even vacuum your car’s interior to get the spotless car you’ve always wanted. 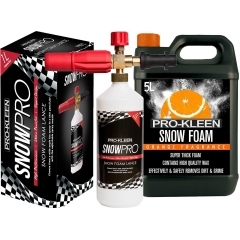 Our Snow Foam is specially designed to produce a super-thick foam that clings to the surface of your car. 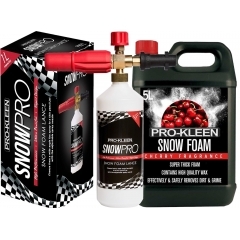 This increases the contact time between the foam and the dirt that’s on the surface of your car, making our Snow Foam a great way to break down dirt and traffic film. These bundles let you follow up a snow foam pre-wash with a wash and wax contact treatment to clean, shine, and protect your car even more! Dull and discoloured wheels can drag down the whole appearance of your car, but sometimes it seems like it’s impossible to put the shine back into them! If you find your wheels are looking dingy even after your usual car washing routine, they might have a case of iron contamination. This happens when iron particles wear away from your brakes and cling to your wheel trims, causing them to look dull and yellowish. 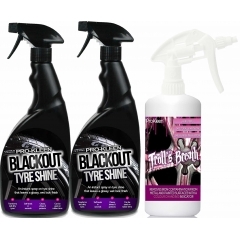 Our wheel care kits contain our fast-acting iron contamination remover as well as our fast-drying tyre shine, to make your wheels and your tyres look like new once again! Need pH neutral car care? This bundle contains pH neutral snow foam and car shampoo to clean up your car’s bodywork without affecting any of the wax sealants that might be on it. If your car has an old or sensitive paint job that needs extra protection, this is the kit for you. Don’t forget the interior of your car needs some care, too! 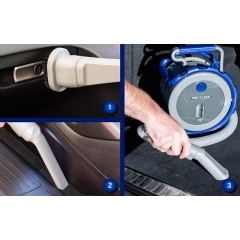 This handheld car vacuum cleaner is powerful and easy to manoeuvre around every nook and cranny of your car. Clean dust from in between car seats, inside footwells, and under your pedals to freshen up the inside of your vehicle. 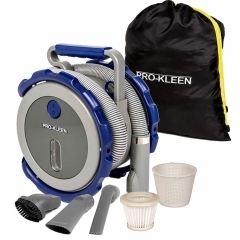 This kit comes with a vacuum, nozzle attachments, and a handy carrying bag for your convenience.